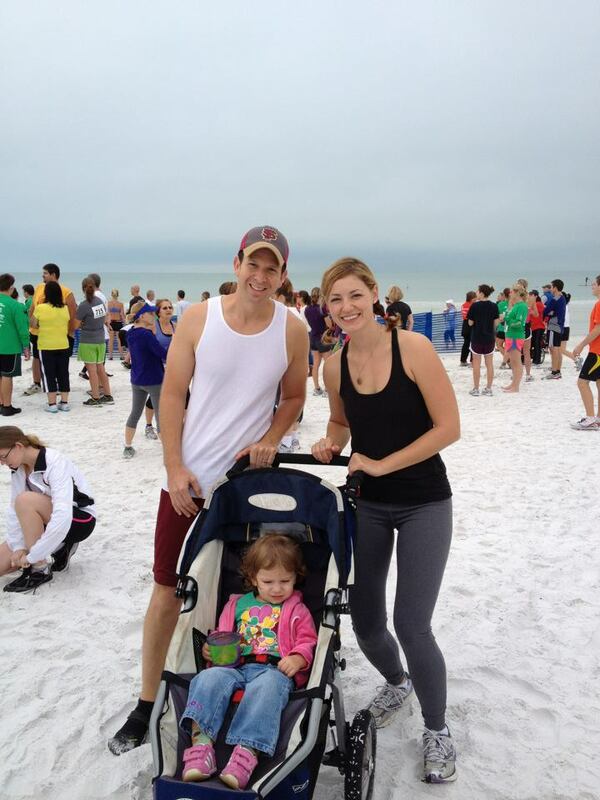 35th Annual Sandy Claws Beach Run! As the sun comes up today I find myself at a local Starbucks with a sleeping toddler in the stroller next to me. Of course this was after a 5am wake up call and a drive around the city a few times to get her to fall back asleep – BUT I am sitting outside enjoying my coffee so life is good 🙂 The past week has been filled with lots of family activities and getting ourselves settled into the new place. Corey and Domino made it down safely and were quickly thrown into the mix of family hugs and sunsets by the beach. The house we are renting has a great set-up for our family, a nice kitchen so we can cook meals at home, a garage equipped with bikes for our daily travels to the village and my personal favorite a beach and pool within walking distance. We have less clothes so that = more laundry and two great dishwashers – Corey and Jessica 🙂 It’s pretty easy to quickly remember why we love our time here at Siesta Key – sunny days, runs on the beach and quality time spent as a family. We’ve had a chance to meet some of our neighbors and a very nice family with a 3yr old and 1 yr old live right across the street from us. In fact we went to the 1yr olds birthday party last weekend. It was a great way to get to know the people in the neighborhood and find out where all the moms hang out. I have to admit going to a party where you don’t know anyone – even the people who are hosting the party – pushed us both a little out of our comfort zone. When we got there the house was decked out in the Sock Monkey theme and the little birthday boys face was on a banner, the plates, the napkins and even the cake – too cute! We were met with friendly faces and Talia quickly introduced herself to all the toys in their playroom as Corey and I made our way around the room introducing ourselves and starting up conversations with the other families. At the end of the night we both agreed that there was a good mix of families there, some we might fit in with and some maybe not so much, but overall a good group of people and the best part, it was catered by Chick Fil A so you really can’t go wrong when the main entrée is chicken nuggets for the kids and chicken fingers for the adults! Branching out is going to be important on this journey. It is not the easiest most comfortable thing to do but it will help us determine if this is a great place to visit or an even better place to live. Only time and a few pushes outside the comfort zone will tell.